Anyone who has been to a night club, concert or school dance has probobly seen a colour organ. Colour organs cause lights to blink and flash to music from your TV, stereo, guitar and even your own voice. The colour organ presented here needs no connection to the sound source, it picks up sound from its built in microphone. R10, R11 and R12 control the response of the different lights. The circuit can handle up to 300 watts per channel. This circuit is NOT isolated from the 115 Volt line. If it is used with the case opened or not installed in a case, you could recieve a bad shock or be killed. You can also use the Teccor S2003LS1 SCR for SCR1. These give better sensitivity and brightness than the 106B1 units. 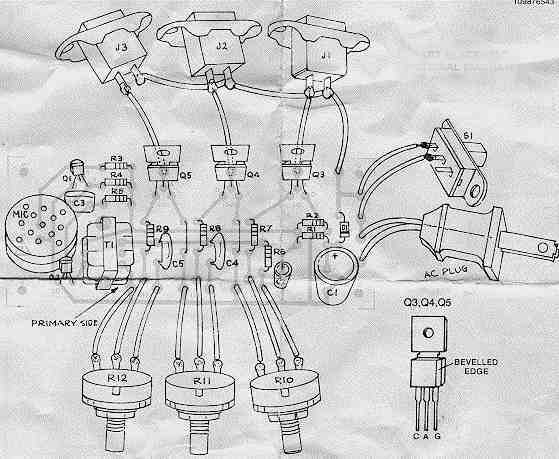 Thanks to James Maloway for redrawing the schematic. I would HIGHLY recommend putting a fuse between Switch and D1. It is a good sample design. Be careful you could be in dangers getting electric shock by using this design do to component failed. I would not follow this design as is. Where can I find a 10K to 600 Ohm transformer? I cannot find anything that is too ridiculously expensive. I just built this circuit, and it doesn't work, any troubleshooting tips? which way does the transformer go? I've checked the circuit to the schematic and it seems right to me, except I'm not sure about the transformer. Just built this circuit and it works great. Using a RCA connector instead of the mic and connecting it to the audio of my home theater system. I have built this and it works great. For those asking, connecting the two leads from a headphone jack cord or whatever to where the mic leads would be works just as well. How could you get an input from an audio device, instead of a microphone? Thank You! I've just built this schematic here in my classroom and am having difficulties with it. I noticed when I ordered the crystal microphone from Mouser Electronics that it is polarized but it is not specified in the schematic. I've tried both ways: one way I get a buzz sound and it was stop as I touched the mic, the other I got nothing lol. I'm not quite sure what I'm doing wrong here. I also did a ohm reading on the transformer I ordered as well. I ordered the same one on your parts list however I'm getting a reading of only a few ohms I'm guessing that could be the issue lol. Any ideas would be great.